You want a trip that looks like you? A unique experience that you have created yourself? Don’t look nowhere else: thanks to our experience and our contact all over Lapland, thanks to our years of work and trust with our partners we are now able to customise a trip tailored made for you. We have accommodation for any taste, activity option ranging from adventurous to chill and relax under the northern lights. We make your trip easy for you and offer you airport transfer if requested, full board options, winter clothings, some self-guided trip and much more. Well Lapland is quite huge but you’ll be landing at Kiruna airport, the furthermost town of Sweden. This little mining town offer everything you might need like restaurants, pubs, shops etc. 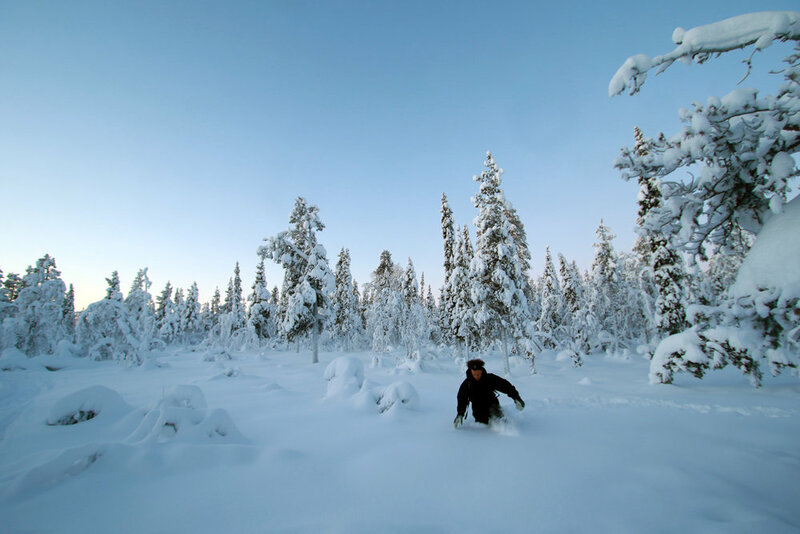 All our options are situated well above the polar circle, in the arctic region of Sweden. We’ll pick you up at Kiruna airport. Here are presenting 3 options that we think cover about the different experiences you can have in the area. Hotel in the center of Kiruna: Here’s the opportunity to taste at the everyday live of the inhabitants from the great north. Stroll around the streets of this little town and chose your best restaurant or souvenir shop. Breakfast and winter clothing provided. Aurora Camp: Be in a cabin in the heart of the nature. You’ll be on the river bank of the Torne river deeply frozen in winter. The camp is quite simple but offer all you need for a calme stay in the nature. Here you can see the northern lights from the river as no light pollution comes to disturb the spectacle. The room vary from a share cabin with private room and share kitchen, bathroom, toilet and sauna to delux private cabin with private bathroom, toilet and sauna. No shopping possible around there but we can make a stop for you to shop what you’ll need for your stay in between your arrival at the airport and the transfer to the camp. Possible to have full board option at the camp as well, need to arrange it before but we take care of it for you. Lodge in the nature: This is probably the best option if your budget allows you to. Even though this place seems a little more pricey, the experience you’ll get out of it worth definitely the extra spending. Note that you’ll definitely be too far away from any sign of civilisation so full board is in the program and that’s actually the good deal about it because the food is simply outstanding and the atmosphere more than peaceful. Located in between Kiruna and Gällivare, 40 km south of Kiruna, this lodge is composed of private rooms with private bathroom and toilet and each rooms having door open to the nature. Observe the northern light from your doorstep, walk a 10m for the bar/restaurant and a 20m for the sauna, nothing better to relax after a day of winter activity. Feel the remoteness and the wilderness right there, where you are. Here you definitely don’t need to take any northern light tour because there is no light pollution to disturb the show nor other tourists from other company doing a snowmobile tour. Just enjoy the nature and the fantastic service this accommodation is reserving you. Arrival to Kiruna. Transfer to your hotel and check in. Getting your winter clothing. Access to sauna. Full day activity. Sandwich and coffee for lunch. Back to the hotel in the afternoon. Access to sauna and feeling the power of the dogs pulling you across lakes and forests. Full day activity. Loads of adrenaline today and then you’ll go far into the wilderness. Sandwich and coffee for lunch. Back to hotel in the afternoon and access to sauna. Full day activity. Typical lunch cooked on a wooden fire. Great view from the hills. This is the opportunity to see the wildlife as you will be totally silent thanks to this means of transport. Last day. We’ll bring you back to the airport according to your schedule. According to where you’ll be staying at you will have the opportunity to visit the Ice hotel and a reindeer Sami farm on the way back to the airport or we can add a day so to put in those visits that definitely worth the extra day. Best for you is to pick and choose what is best suiting you and come back to us so for us to create the program that you’re dreaming about.